It's that time again - okay, it's an ever-so-slightly delayed September favourites. Apologies for the delay in getting it up, but better late than never, right? 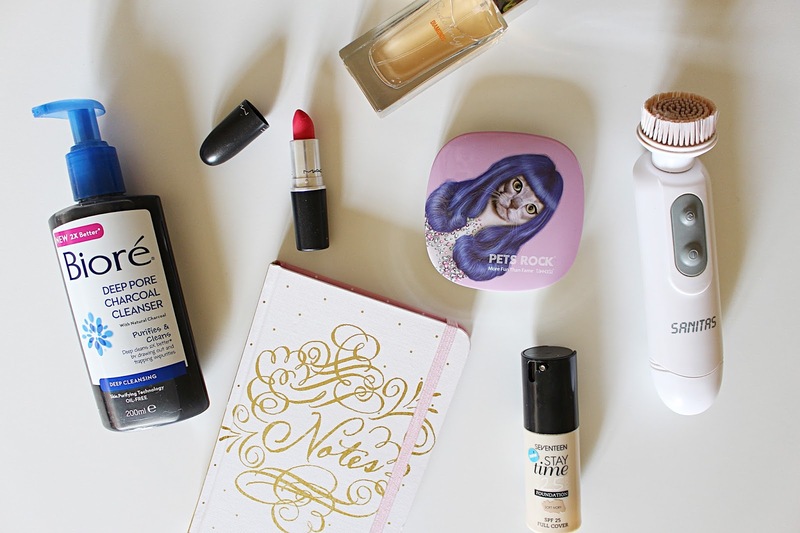 This month I've been loving a mixed variety of makeup, skincare and random bits and pieces. First up, Biore's Deep Pore Charcoal Cleanser* is something I've been wanting to share on the blog for a while now. I received it a little while ago and I've been using it non-stop ever since. Ideal for oily/spot-prone skin, this cleanser works deep down to clean and purify skin, getting right to the nitty-gritty and getting rid of dirt, grime, blackheads and impurities. It has a rather cooling consistency (probably because it's clay-based) and it leaves my skin feeling super smooth and looking really clear. I've actually been using it religiously with my Sanitas Cleansing Brush* from Lidl. The two of them together work amazingly well to get rid of my makeup and then give my skin a really thorough cleanse. I've popped up a full review of the cleansing brush here. In terms of makeup, I've reignited my love for MAC's Impassioned lipstick. You know sometimes you misplace a makeup product and completely forget all about it, only to then find it months later and wonder how you ever coped with out it? That's basically what happened here. I left it in one of my many 'night out' bags and it sat forgotten for months on end, but now I'm reunited with it I couldn't be more pleased. Impassioned is a gorgeous bright pinky red, and makes a really lovely colour for this time of year. I also discovered a new foundation in September, which is a pretty odd one for me, as I swear by Estee Lauder's Double Wear and never really stray far from it. I stumbled across this after my sister recommended it - I'd ran out of my beloved Double Wear and pennies were tight so I thought there was no harm in giving this £6.49 17 Stay Time Foundation a go. For the price this is by far one of the best foundations I've ever tried - it is seriously thick, full-coverage and fairly long-lasting. I will have a full review up on it very soon, so watch this space! Another Lidl spesh, I couldn't resist putting their 'Suddenly Diamonds' fragrance* in here, as I definitely got a lot of wear out of it over the month of September. A really fresh floral scent, I received countless compliments when wearing this and for the amazing price it is totally worth a try. Finally, on to random favourites and there's just a couple this month. First up, the lovely people at Pets Rock sent me over this awesome 'Power Bank'*, which is basically a portable charger that you can use to charge multiple devices up at once. If you're a complete computer nerd and have your devices on the go all the time (like myself) then this would be ideal - it also has enough room for a fair few phone charges and one tablet boost. The best thing about it? It lights up and has a cat that looks remarkably like Katy Perry on the front. What more could you want? The last thing I was loving last month was stationery-related, of course, in particular stationery from TK Maxx. I could have dropped about £100 in there but luckily I refrained, coming back with only a couple of bits including this cute little 'Notes' book in pink and gold. It looks very Kate Spade-esque to me but was a mere £3.99 so thought it was well worth a mention! What were you loving throughout September? I'd love to hear!